What!? Sound revealed as an element of the elements! A music of the spheres? Yet the sounds uttered were human, guttural, raw—elemental. Residing in the gaps between the units of the grid was deep feeling that Bernstein contacted and brought forth. We witnessed, not a recitation after all, but a magic, a creation. 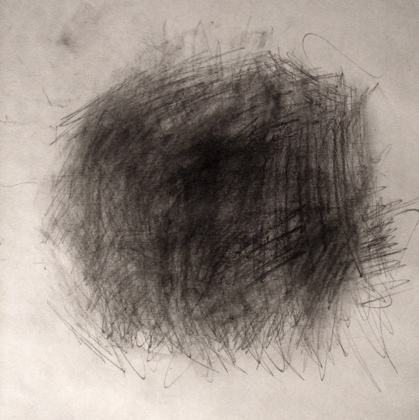 Bernstein recombined the basic stuff of physical being into a new kind of matter: a poem. I recently heard a lecture, On the Lyric, by Norman Fischer, a Jewish Zen teacher and poet whose work, though lyrical, enters, as does Bernstein’s, the sphere of the abstract, the so-called “language poetry.” Fischer says the roots of the lyric reach back not only to the Greeks, whose rhetoric tends to tell us about the world, but also to the very different Hebrew imagination. This imagination makes a poetry, as in the psalms, that is a private conversation between the poet and “God,” the unknowable. A reader of such poetry becomes party to these conversations. But we are not being spoken to directly; we are being allowed to overhear a sacred argument, a holy wrestling. This type of lyric does not explain anything, says Fischer, but instead lets us feel something. If the poem is effective what we feel is the inarticulate sensation of universal human longing for the divine connection, and the grappling with its out-of-reachness. I was grappling with opposites, especially the seeming contradictions of will and feeling, intention and flow, logos and eros, meaning and emptiness. In this exploration, influenced by my typographer husband, I discovered words and letters anew: as entities that could convey, through shape, juxtaposition, size, color, and texture, a meaningfulness that existed in addition to their literal meaning. The opposites were not opposed, but intertwined. In the beginning was the Feeling that permeates and underlies the Word. 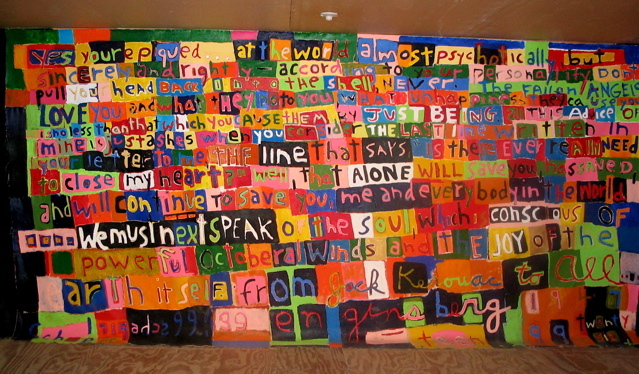 Schapira’s Letter from JK to AG makes words into colors and shapes, figures on a ground, and separates the individual words into a grid of vivid bubbles that float off the canvas independent of their original context. The words of the original letter become like recombinant strands of DNA. Schapira allows different meanings to arise, form, and re-form, as our eye-ears connect the color red with red and “wHAt” with “frOM.” And, we are privy to Schapira’s wrestling: “my Alone, we must speak!” is what I overhear, what I read over Schapira’s shoulder. Still, the letter Kerouac wrote, its ostensible meaning, is not totally obscured by the new revelations. 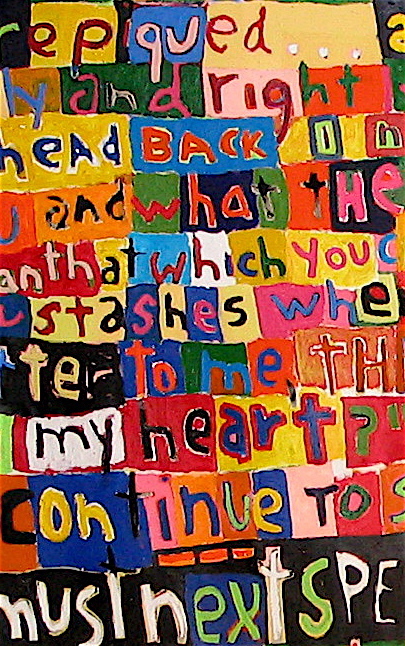 Abstraction and representation live side by side, and even become one thing: Schapira abstracts the content of Ginsberg’s letter as he represents the shapes and forms of letters and words. 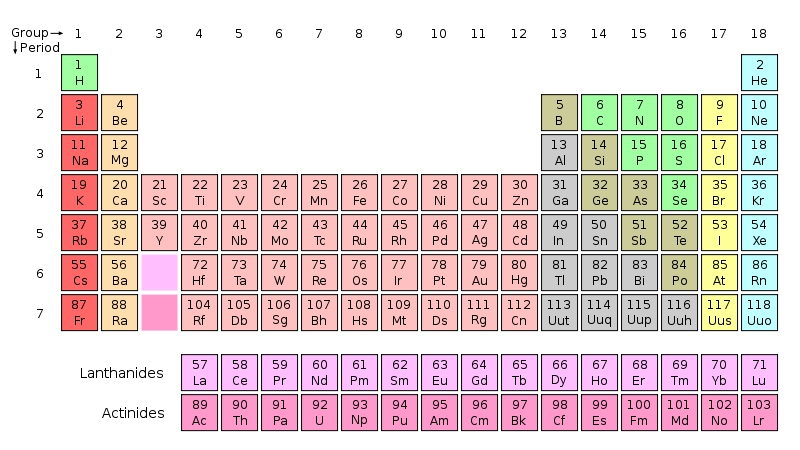 Similarly, Bernstein’s utterance concretized (represented) the abstraction of the periodic table, revealing the feeling that resides within its seemingly cool structure. 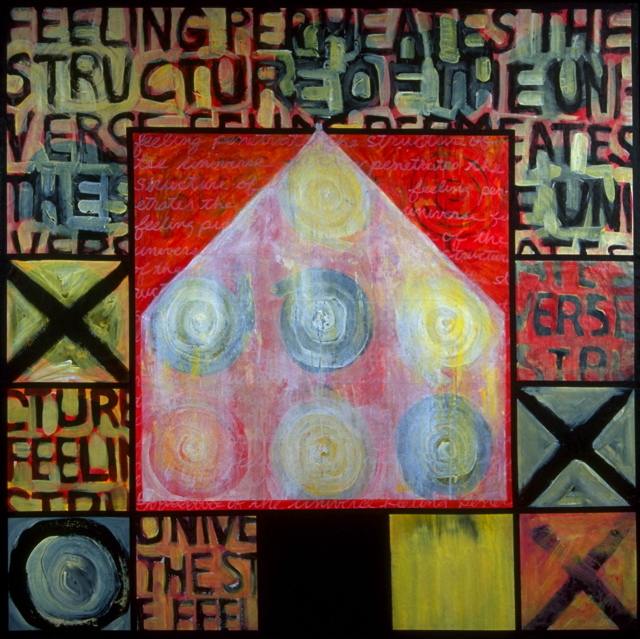 The elements themselves, the periodic table of the elements, Bernstein’s poem of same, and the two word paintings inhabit the same generative universe, the place where we all live and look for the meaning we can never quite find or understand. The Arts & Crafts is a place where you hang out and make things if you feel like, and talk about this and that—if you feel like. There are lots of materials around, and things other people made in various stages of done-ness. There are also things you made and things you left unfinished, and might or might not get back to. In a cubby on the wall, there’s a little box with your name on it, and it contains scraps of colored paper and pieces of wood you found interesting. You fool around, and maybe somebody shows you how to do something. There’s a back room that doesn’t have windows and the best materials are there, stores of them. Candy bars, too. The person who runs the place is a bit nuts and doesn’t fit in, and that’s exactly why you like to go there. There’s little of significance anywhere. You are not engaged in anything “important,” although you are very engaged. You understand the blessed concreteness of tile ashtrays and lanyards, and the alchemical transformations of the enamel jewelry oven. You make things for your mother, as well as for yourself. I spent all my childhood summers in a place like this. The happy chaos of the Arts & Crafts, its aura of permission, its lack of pretension, still compel my imaginings about what it really means to make art. What if I sprinkled my words with metal powders and let them coalesce without help in a special oven? What if I braided my lines and sentences like lanyard cord, and just left the long strings hanging when I get bored? What if I roamed from project to project, and copied what you were doing because I liked it? What if I snuck into the back room when no one was looking, and made off with some fabulous stuff—because I knew the truth, that it was all there for me? *”Doin’ Your Thing at the Crafts Shop” is the title of a song about the Arts & Crafts at Brant Lake Camp in New York State. Words and music by Irwin Cohen. The person who ran the place was Mike Ilgner. 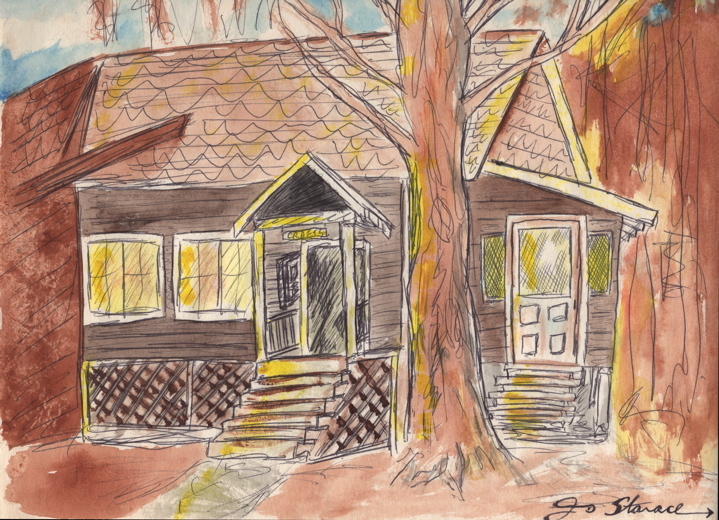 The painting, of the actual building, was made by my late brother, Joseph Starace, when he was a boy.